I like this shot because… well there’s no reason other than it’s cool! [This photo is a couple years old, but still an example of cloud cover] Does anyone know why clouds always show up red in [my] astronomy photos? Here’s a li’l gallery of some of my spooky sky photos that are still worth posting. PHOTO BLOG: St Patrick’s Sky! A gorgeous day gives way to a beautiful clear night where I can see by the light of the moon! Okay, poetics aside, it’s really nice out. 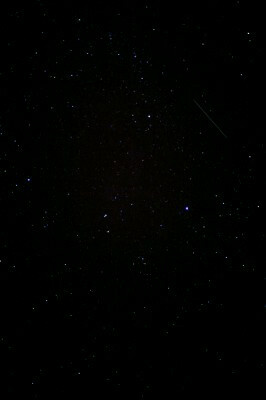 So much so that I went outside and took photos of the stars. 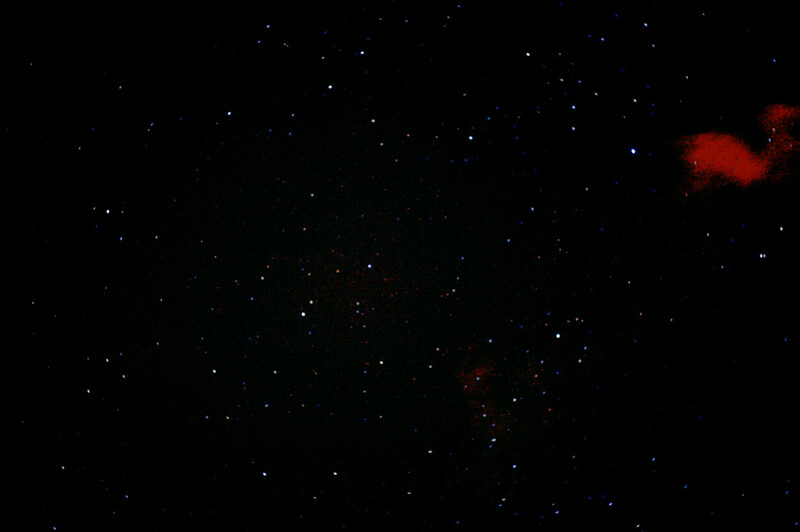 So I’ve almost tweaked my set-up for taking pictures of the night sky, and now with Photoshop able to help me actually /see/ the stars in my shots I feel confident enough to share some of my first attempts with you. As I am a night-owl (or, more accurately, a term I learned from watching Archer, crepuscular) person, astrophotography seems a natural hobby as a combination of being awake at odd hours and a fascination with the stars. I learned in my rudimentary research that really nice photos of nebulae and the like are made by layering multiple shots. I also know that really detailed shots require an actual telescope but I’m not that financially invested in this. That being said, curves and levels are awesome! Photoshop can help one use the raw data of the photo to reveal a magical and wonderous world that almost-entirely-black photo hid from view! I suppose it would be like comparing the naked eye view of the sky with that of a telescopic one… anyway, technology is grand. Telescopes or editing software, however you stargaze, as long as you’re happy. And hey, in a few short weeks I’ve gained a remarkable amount of knowledge in both camera skill and editing. Plus, I get pretty pictures. Of course, clouds ruin everything. Or look like weird nebulae. But living in Vancouver, my biggest struggle is finding a time when I’m free, the stars are visible beyond the veil of rain, and the lights around me are dim enough that I can get decent enough shots. This isn’t the best season for it, I know but I’m having fun anyway. Besides the skills I’ve gained on the photography side, I’m also learning A TON about astronomy. I didn’t know much before so my gains are pretty elementary, but expanding my mind is more than enough for me. Now, while you ponder the infinite expanse, I have to go see check how cloudy it is and bring in my tripod before the rain. Does anyone out there have any tips or opinions on the final product? Would several short exposures layered look better than a few longer ones? Or, just not layering? The red-cloud shot is the only one in this collection with more than 2 layers and I’m still not sure how I feel about it. Which looks nicer? What do you think?